August 9, 2012 - Segment 1 - This week, we’ll be talking about the influence of money on the 2012 elections, and American politics in general, today. August 9, 2012 – Segment 1 – At 5pm, join us for the premier broadcast of our new series Beyond the Spin! Every week, we’ll be taking an in depth look at the issues that are important to our communities during the 2012 election season with public radio journalists from around the country. 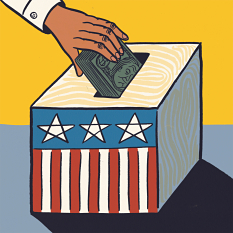 This week, we’ll be talking about the influence of money on the 2012 elections, and American politics in general, today. Marge Kalama, producer, announcer and host of the weekly program Talking Drum at KWSO on the Warm Springs reservation in Oregon.